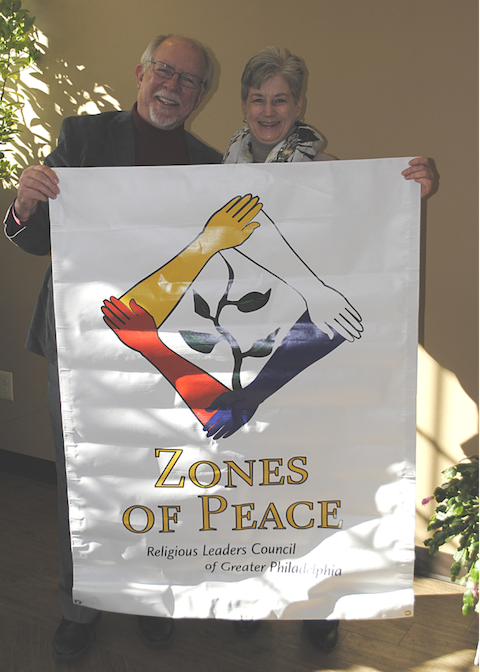 Cranaleith held an event on Sunday, November 11, 2018, to celebrate its designation as a Zone of Peace by the Religious Leaders Council of Greater Philadelphia. “We chose Cranaleith is a Zone of Peace because of its role in offering people from all backgrounds a place free from fear, filled with respect, and marked by deeds of kindness,” said Rev. B. Hougen, Ph.D., Coordinator of the Zones of Peace Initiative. Rev. Hougen presented Cranaleith with a banner which will be displayed on the Center’s grounds. Participants prayed for the urgent need for peace around the Center’s peace pole and made peace flags. Cranaleith offers a range of programs that address needs in the local community as well as global issues. In partnership with the U.S. Veterans Administration and veterans organizations, Cranaleith provides free days of healing to women veterans suffering from PSTD or other challenges. Working with the Roman Catholic and Episcopal Dioceses, Cranaleith also offers training for local clergy from all traditions to minister more effectively to veterans and their families. “Conversations that Matter,” is an on-going series that brings together people with diverse experiences and convictions into thoughtful and civil discussions, breaking down barriers and building mutual respect and trust. A garden therapy program and is offered in partnership with local nonprofits serving persons who are intellectually and/or emotionally challenged. The Religious Leaders Council was founded in March 2006 aiming to build relationships of mutual support, offer a moral and spiritual voice in the region, and identify issues of concern for dialogue and action. Co-convened by Archbishop Charles J. Chaput, Rabbi David Straus, Imam Anwar Muhaimin, and Bishop Daniel Gutierrez, the Council is the first of its kind in the city, with more than 30 member communities, representing more than two million people of diverse faith traditions from across the greater Philadelphia region.